SANTA CLARA, Calif. /California Newswire/ — SecuGen, a world leading optical fingerprint device and technology vendor, is pleased to be displaying the recently released U10 ultra-slim fingerprint sensor, at the 2018 Global Security Exchange expo in Las Vegas. 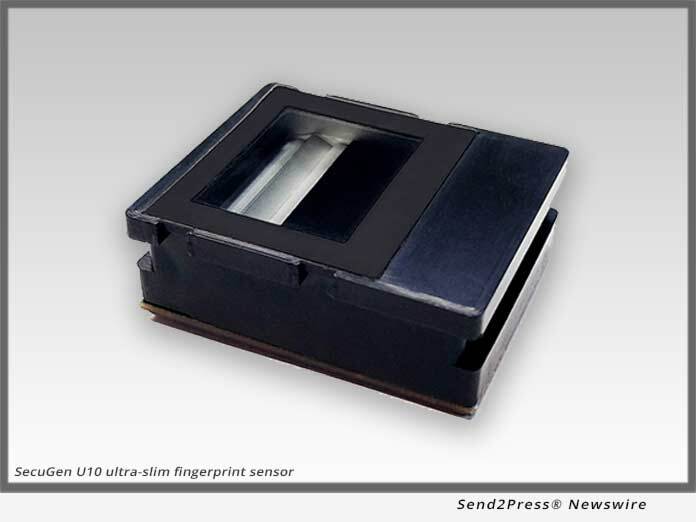 The U10 sensor is the sensor used inside of SecuGen’s newly released Hamster Pro 10 fingerprint reader. Only 12 millimeters thin, the U10 is the world’s thinnest FBI certified FAP 10 optical fingerprint sensor. The U10 can be easily embedded in nearly any type of hardware device, such as ATMs, access control devices, laptops, handhelds, industrial equipment and many other types of products. SecuGen’s U10 sensor is FAP 10 certified by the FBI, rugged with an optical glass platen, and easy to integrate using SecuGen’s full suite of free software developer kits. Both the U10 sensor and Hamster Pro 10 fingerprint reader are compatible with SecuGen’s free SDKs for Windows, Linux, and Android. The Hamster Pro 10 also works with Windows Hello right out of the box for convenient fingerprint login to Windows 10 computers. SecuGen fingerprint products and technology are distributed through a worldwide network of development organizations including hardware OEMs, independent software companies, and systems integrators. The U10 sensor and Hamster Pro 10 fingerprint reader will be on display in SecuGen’s booth # 2983 at the 2018 GSX expo held at the Las Vegas Convention Center from September 25 to September 27 in Las Vegas, Nevada. SecuGen Corporation (secugen.com) is the world’s leading provider of advanced, optical fingerprint recognition technology, products, tools and platforms for physical and information security. SecuGen designs and develops FBI-certified fingerprint readers and OEM components, developer kits and software, including NIST/MINEX-compliant algorithms. Known for high quality, ruggedness, and price-performance, SecuGen’s products are used across a wide range of industries, market segments and applications around the world including insurance and banking, medical and health care, point of sale, logical and physical access control, mobile devices, AFIS and law enforcement, and national ID and voter ID projects.